From Manhattan to Murfreesboro, Tennessee, the right wing’s efforts to demonize Muslim people has turned mosques and Islamic cultural centers into political battlegrounds. All progressive people have a responsibility to stand against the spread of this hatred, and we support all of the mobilizations that have been organized in defense of religious freedom and the Muslim community. The impact of this was made painfully clear on August 30th when a cabdriver, Ahmed Sharif, was slashed across the face by his passenger after revealing that he is Muslim. In Tennessee, construction vehicles working on the expansion of an Islamic center were set ablaze, and gunfire has been heard there and at other mosques. In the context of an overall climate of Islamophobia, it’s not hyperbole to recognize these not just as individualized violence, but as terroristic acts, intended to target a whole community. Vilification of Islam and of Muslims is not a wholly new phenomenon. The mythology of Islam and Muslim countries as exotic “others” with stark cultural contrasts to the “West” actually pre-dates the foundation of the United States—most dramatically acted upon with the Crusades and the Spanish Inquisition. While there is little real connection between this history and recent events, comments like George Bush’s September 2001 remark that “this crusade, this war on terrorism, is going to take awhile” cemented it as a powerful metaphor for popular understanding of the wars in Afghanistan and Iraq. More recently, the growth of U.S. empire has always required a populist justification for nearly non-stop wars. Territorial expansion into the lands of Native Americans created a script of the civilizing mission of “Christian values” and capitalism versus savage, backwards enemies. In the twentieth century, petroleum’s rising importance for energy and manufacturing led to the oil-rich countries stretching from North Africa to Central Asia became a centrally important region of political and economic concern. But until relatively recently, Communism filled the role of imperialism’s main bogeyman. In fact, when Soviet-allied, nationalist populism dominated politics in many Muslim countries, the CIA funded fundamentalist Islamic organizations—and red scares were the primary means of tainting any domestic opposition to imperialism. As recently as the Reagan years, Islamist fundamentalists in Afghanistan (the precursors to the Taliban) were praised as allies in the war against communism. By the end of the Cold War and disappearance of communism as a credible threat, conservative theorists like Samuel Huntington began speaking of a “clash of civilizations” —which provided the perfect foil to frame the terrorist attacks of September 11, ripped from their historical context of U.S. intervention in the Muslim world. 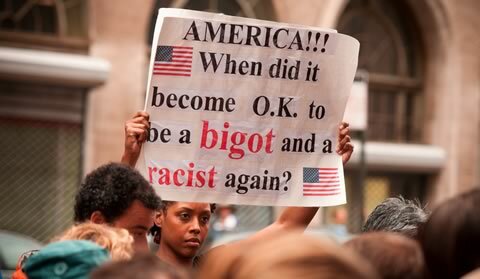 Ironically, after it had been unleashed, we see that this bigotry can have its own momentum. 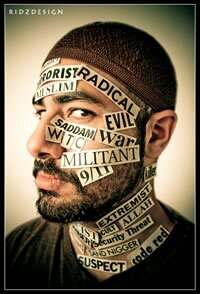 Now, Barack Obama—the commander-in-chief who has continued the wars in Iraq, Afghanistan, and Pakistan—is himself a target of the Islamophobic atmosphere that the wars set in motion! Connected to this history, there have long existed currents of Black Nationalism and African-American conversions to Islam which recognize this Muslim heritage, most visibly the Nation of Islam. Since 1965, the relaxation of immigration quotas from non-European nations has been a “pull” factor in emigration of Muslims from Asia, the Middle East and Africa—alongside the “push” factors of military and economic destabilization in those areas. Relative to other immigrant communities, Muslims (while largely working class) are more represented in the “middle class” of professionals, and small business owners. As a result, this combination of relative economic advantage and racial disadvantage has made some Muslims and easy target for whose who wish to misdirect working-class anger about the wars, unemployment, and other social problems. As a pan-ethnic religious and cultural group, many Muslims also confront specific forms of racism—as Black people, for example, or the “perpetual foreignness” faced by many Asian-Americans. Islamophobia overlaps, too, with anti-immigrant xenophobia—especially in places with many Muslims who are recent immigrants. This is all to say that, while Muslim communities have a specific and unique history, the similar experiences faced by other oppressed groups offer some ideas for dialogue and coalition building. Let’s be clear on a few things: there is no connection between 9/11 and Islam as a religion, or with all Muslims. These is no reality to the “threat of sharia law being instituted anywhere in United States”. A world religion with over one and half billion adherents can hardly be fit in the stereotyped box promoted by narrow-minded bigots. However, in the absence of a strong progressive alternative, these ideas can and have developed a real following among people in a state of shock and fear due to the wars and unemployment. That’s why it’s so important to make the case that everyone, whether they are secular or religious in any form, have a common stake in fighting back against this assault. In Murfreesboro, local Solidarity members helped initiate Mid-Tennesseans for Religious Freedom (MTRF), a broad, democratically run coalition. On July 14, MTRF organized a counter-demonstration that outnumbered a protest of mosque opponents led by the World Outreach Church. Since then, the public involvement of Solidarity in MTRF has been used in attempts to discredit the coalition. The success of MTRF is a testament to the work of all its members and to local support for religious rights and anti-racism, not evidence of socialist conspirators. Solidarity is a non-religious, revolutionary socialist organization that—while mainly atheist—includes Muslims, Christians, Jews and other members with religious beliefs. Our political values include defense of the democratic rights outlined in the Bill of Rights and of the rights of all oppressed communities, including religious minorities. On August 28, the construction vehicles were covered with gasoline and burned at the mosque’s future location. Considering the firebombing of a mosque in nearby Columbia that was also covered with white supremacist graffiti, this terroristic vandalism is very serious. Solidarity stands with the Muslim community in Murfreesboro and around the country against racist threats and attacks.